Members' exclusive: enter our ballot to win an exclusive afternoon tea for two in the Portrait Restaurant with views over London, tickets to the five-star exhibition Elizabethan Treasures: Miniatures by Hilliard and Oliver, and exhibition catalogue. The portrait miniatures of the Elizabethan and Jacobean periods are hailed among the greatest works of art ever produced in the British Isles - and this is the first major UK exhibition of these exquisite and precious miniatures for a generation. Winners of this exclusive ballot will be able to bring along a friend to the exhibition of these treasures for free, so you can both explore the jewel-like world of portrait miniatures and learn more about what these intimate images reveal about identity, society and visual culture in the late 16th and early 17th centuries. Afternoon tea for the winners includes a selection of dainty sandwiches, scones and cakes plus limitless tea in the delightful Portrait Restaurant, which overlooks some of London's most-cherished landmarks. 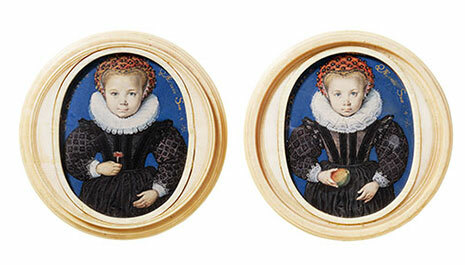 Elizabethan Treasures: Miniatures by Hilliard and Oliver is at the National Portrait Gallery from 21 February 2019 to 19 May 2019. Possibilities members can win an exclusive pair of tickets to the Elizabethan Treasures: Miniatures by Hilliard and Oliver exhibition - including afternoon tea - at the National Portrait Gallery, London, during the weekdays of 13-17 May 2019. A pair of tickets for the exhibition. Afternoon tea for two in the Portrait Restaurant. The exhibition opens daily at 10am and closes at 6pm. Open late on Fridays until 9pm. Afternoon tea is available from Monday to Friday inclusive at 3.30pm, 3.45pm, 4pm and 4.15pm. Closing date for this ballot is Friday 19 April at 9am. National Portrait Gallery, St Martin's Place, London WC2H 0HE. The nearest mainline railway station is Charing Cross. Closest London Underground stations are Leicester Square, Covent Garden and Charing Cross. Once the ballot has closed and the winners have been drawn, they will be notified by email to confirm they can attend. Winners will be given all the necessary information about how they will receive their tickets. Tickets are non-exchangeable and non-refundable, and cannot be transferred to someone else. Ballot prizes include tickets only; no travel or accommodation is provided unless stated. Winners will be notified within 48 hours of the ballot closing. Please double check your spam/junk mailboxes as we wouldn't want you to miss out! Unknown girl aged 5, unknown girl aged 4, 1590, by Isaac Oliver. © Victoria and Albert Museum, London. Francis Bacon, later Baron Verulam and Viscount St Alban, by Nicholas Hilliard. 1578 © National Portrait Gallery, London. Unknown Woman Wearing a Hat c.1590-5, by Isaac Oliver. Royal Collection Trust/© Her Majesty the Queen Elizabeth II 2019. Elizabeth I 1572, by Nicholas Hilliard. © National Portrait Gallery, London. 5. The opening date for entries is 9am on Monday 25 March 2019. The closing date of the ballot is 9am on Friday 19 April 2019. Entries received after this time will not be counted. 7. A winner will be chosen by random draw supervised by an independent person on Monday 22 April ("Draw Date"). 8. Each winner will receive a pair of tickets for an afternoon tea for them and their pus 1 at the Portrait Restaurant at the National Portrait Gallery and an entry ticket for them and their plus 1 to the Elizabethan Treasures: Miniatures by Hilliard and Oliver exhibition + 1 free catalogue each. Please note any other expenses incurred during the experience are the responsibility of the winner and NOT included in the prize. 9. The winner will be notified by email or telephone (using details provided when activating their membership) before midnight Tuesday 23 April. If a winner does not respond to the Promoter within 5 days of being notified by the Promoter, then the winner's prize will be forfeited and the Promoter will be entitled to select another winner in accordance with the process described above. 10. The prize will be sent to the winner by post or email (using details provided when activating their membership). Tickets and/or an event itinerary will be sent to winners no later than 5 working days prior to the event taking place. 12. The prize is supplied by the National Portrait Gallery (the "Supplier"). The Promoter reserves the right to replace the prize with an alternative prize of equal or higher value if circumstances beyond the Promoter’s control make it necessary to do so.